geeklog- ultimate geek knowledge: How to activate Windows Vista? How to activate Microsoft Office Suite 2007/08? How to activate Windows Vista? This is a simple and brief guide on how to check if your Windows Vista is activated or how to activate the Windows Vista if it's not already activated. Activation helps verify that your copy of Windows is genuine and that it has not been used on more computers than the Microsoft Software License Terms allow. In this way, activation helps prevent software counterfeiting. With an activated copy of Windows, you’ll be able to use every Windows feature. Activation and registration are not the same. Activation is required, but registration is not. Activation is the process of ensuring that your copy of Windows is used according to the Microsoft Software License Terms, whereas registration is the process of entering information (such as your e‑mail address) to sign up for product support, tools and tips, and other product benefits. You must activate Windows within 30 days after installation or Windows will stop working. Windows Activation Client can be opened from Windows\System32\slui.exe or alternatively just type slui in the start menu search box. You can activate either online or by phone. To activate online you need an Internet connection. Activating by phone requires interacting with an automated phone system. The following screen appears after a successful Activation. 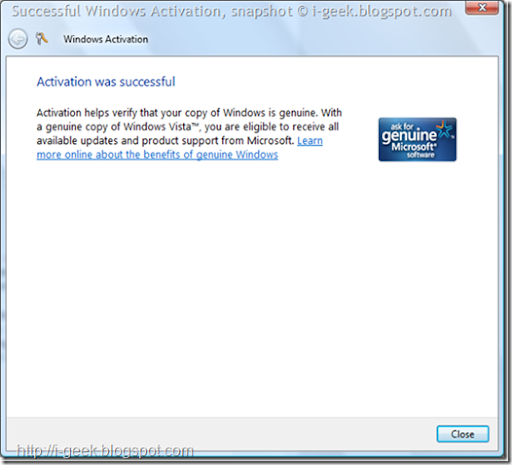 The Windows Activation Wizard says "Activation helps verify that your copy of Windows is genuine. With a genuine copy of Windows Vista, you are eligible to receive all available updates and product support from Microsoft. You can also see the Activation status in Control Panel\System and Maintenance\System ie on View basic Information about your computer.